Since its introduction over ten years ago, the Epiphone version of the venerable Gibson 335 Dot has been wowing guitar players all over the world. The Epiphone Dot with fabulous semi-hollowbody sound voiced by real Alnico Classic Humbucker pickups, heavy-duty parts, Mahogany neck, Rosewood fingerboard, and chrome hardware is an absolute must for any guitar collection. The Epiphone Dot is Epiphone's version of the venerable ES-335 "Dot" that's been wowing guitar players all over the world for over four decades. Vintage models (with vintage prices) can't compete with the Epiphone Dot, which is simply one of the best deals today for guitar players who want the classic sound of an ES-335 at an affordable price. Epiphone is long famous for its own original semi-hollowbody models from the 1950s Kalamazoo, Michigan era, including the Riviera and the Sheraton. During the same time those guitars were designed and constructed in Kalamazoo, the ES 335, first introduced in 1958, became a favorite of blues, rock, country, and pop acts for its elegant design and wide array of colorful tone combinations. 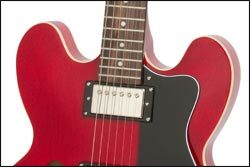 Now, the Epiphone Dot, named in reference to its simple "Dot" fingerboard inlays, brings the sustain and resonance of the classic semi-hollow design for a bounty less than most solid body guitars. The "Dot" is the same axe that has been the bellwether of every rock and roll breakthrough. And now for the first time, the "Dot" puts that classic sound and over 40 years of refinements in your hands, the Epiphone way. The Dot is constructed of premium laminated maple with a mahogany center block and a hand-fitted, glued-in 24.75" scale mahogany neck. Other details include a rosewood fingerboard with traditional "Dot" inlay, a 1.68" nut, a SlimTaper "D" profile, and the traditional Sloped Dovewing Epiphone headstock. The Dot, like all Epiphones, features quality electronic parts including full-size 1" 500K Ohm potentiometers, Epiphone's all-metal pickup selector switch, and a heavy-duty output jack. Its fabulous semi-hollowbody sound is voiced by a pair of real Alnico Classic humbucker pickups. Traditional Kalamazoo style TopHat knobs control volume and tone for each pickup. The Dot includes Epiphone's all nickel hardware including premium 16:1 ratio Grover machine heads for superior tuning stability and accuracy along with Epiphone's exclusive LockTone locking Tune-o-matic bridge and Stopbar tailpiece for great sustain. The Dot comes in four beautiful colors including Cherry, Ebony, Natural, and Vintage Sunburst. The left-handed model comes in Cherry.